Plums (Prunus domestica) provide a number of essential nutrients such as potassium, copper, boron, iron, fiber, antioxidants, sorbitol, and vitamins A and K. Dried plums have also been shown to aid digestive and cardiovascular health, promote bone formation, and have anti-tumor activities. Its value to human health is enhanced by the fact that this fruit lends itself to the processes of drying, storage and transport without losing these benefits. The plum industry has thrived in California for over a hundred years, and the state is the world leader in dried plum production providing 99% of the U.S. supplyand 60% of the world supply. The California Dried Plum Industry--breeders, growers, processors and packers--has supported research in crop genetics and breeding for many years; however, due to the long development time in conventional breeding programs, only two new varieties have been released in the last 34 years. New threats arise to the industry and this long breeding response time presents a disastrous situation if the current varieties prove vulnerable to a new pest or environmental changes. Frankly, such a threat to the dried plum industry currently exists. In 1999 plum pox virus (PPV) was detected in Pennsylvania. 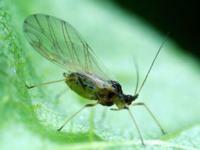 Although aphid-vectored, this virus poses no danger to consumers, but it can ruin the crop by causing acidity and deformities of the fruit. The only way to manage the disease is to destroy all infected trees. Since its initial detection in Pennsylvania, millions have been spent in eradication along with the removal of over 190,000 trees. In 2006, PPV outbreaks were detected in New York and Michigan and tree removal programs were mandated. The USDA-ARS Kearneysville breeding program, under the direction of Dr. Scorza, has developed a genetically engineered PPV-resistant plum tree cultivar, ‘HoneySweet’,which has remained PPV-free over 10 years of field testing in infested regions of Europe (Hily et al 2004; Malinowski et al., 2006). In California, the dominant variety ‘Improved French’ was recently found to be susceptible to PPV in quarantine greenhouse tests (Scorza and Damsteegt, unpublished). 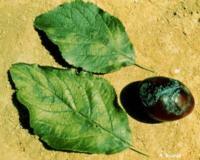 A PPV-resistant plum, would provide the industry with a long-term, sustainable solution to this disease threat. 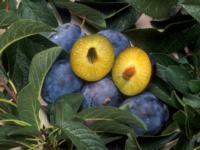 ‘HoneySweet’, however, is a fresh market plum, not suitable for California dried plum production. Higher fruit sugar levels to improve drying efficiency and respond to consumer preferences,improved nutritive value, and pest tolerance.